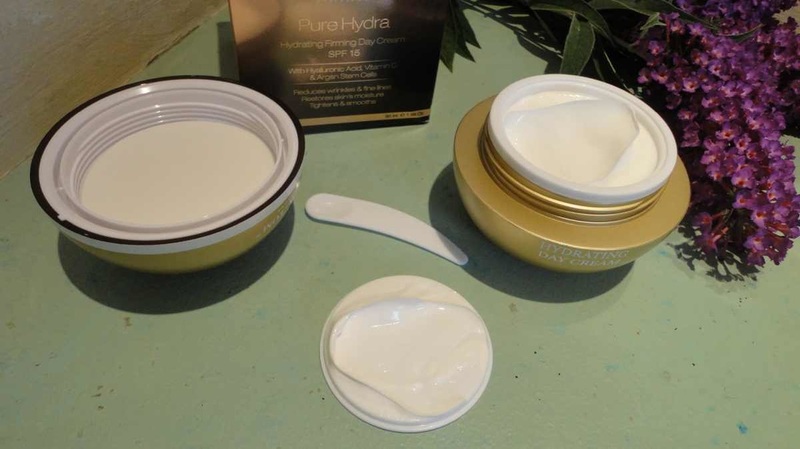 I am so impressed with the whole Pure Hydra line. Based on my personal experience, I would say that it is precisely aimed at mature skin like mine, i.e. 50s and 60s. 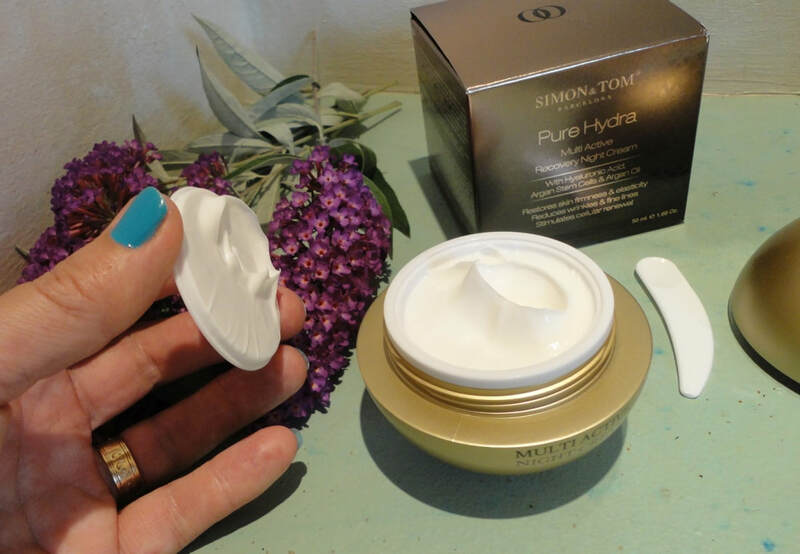 Younger skin can benefit greatly from other products made by this brand (Simon & Tom) but this trio of products really targets the special needs of my generation. The main ingredients are derived from Argan Oil, in the form of Argan Stem Cells and Hyaluronic Acid. They agree with my skin and have not caused any sensitivity. I should also mention that these products are not tested on animals, something I always like to see. This spectacular-looking eye contour treatment looks almost identical to the co-ordinating face cream, but there are some basic differences. The most noticeable is that the eye treatment is almost free of fragrance, whereas the face cream has a pronounced fresh scent. It makes sense as the skin just around the eyes is much thinner and more delicate than elsewhere. If you are prone to allergies, some creams heavy on fragrance might trigger a reaction. Another difference is that the texture is lighter and slightly more liquid, making it easier to absorb. 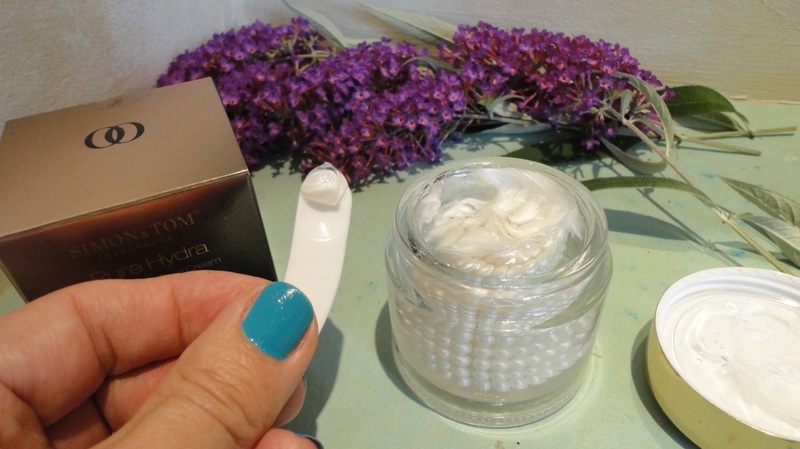 The active ingredients (Argan Stem Cells and Vitamin C) are contained inside small spheres that look just like pearls, suspended in a clear gel of Hyaluronic Acid; the idea is to use the enclosed tiny spatula to scoop a pearl together with a small amount of gel and mix the two before applying. This product works very well for me. Since I really love the face version, I use the two in combination at bedtime. The effect is instantly refreshing and decongestant. 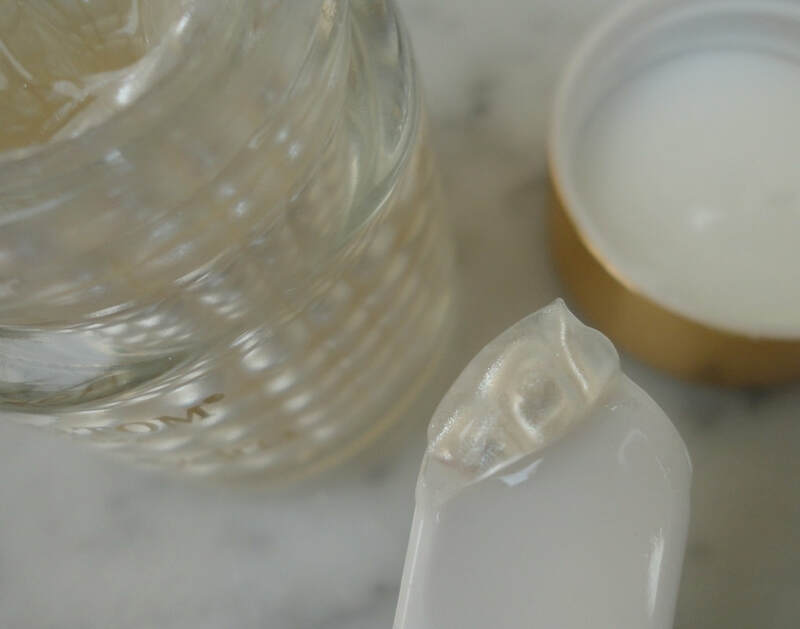 This is the most visibly hydrating product I've ever tried. Just after application, my skin looks wet and feels cool. The gel is absorbed fairly quickly, without leaving any residue. I have a real problem with dark circles and puffiness under the eyes, and this treatment effectively lightened the discolouration and reduced the under-eye bags. No allergic reaction, just smoother skin, with less noticeable lines and wrinkles. It is also a cruelty-free product, not tested on animals and free from noxious chemicals like parabens and phthalates. The clear glass jar holds 15 ml. With two of us using it once a day, it lasted over 6 weeks. I have already bought another jar because I don't want to be without it. This day cream is a lot denser and richer than other day creams I have used. It is marginally less thick than the night cream but capable of a startling disappearing act. I massage a small quantity (and I mean small) over my face after a compatible serum and … where does it go? In seconds it's completely absorbed and leaves absolutely no trace. I can follow immediately with foundation and other make-up and not see any oily residue hours later. Very rare on my mixed skin. The perfume is sublime, like jasmine or lily of the valley, and it does linger in a subtle but delicious way. My husband always seems to notice when I have used it. It's full summer right now and after the pool and some sunbathing, my face can look desperately parched. This cream immediately makes it feel better, smoother and nourished. The elegant container holds 50 ml and looks great on my make-up table. A golden sphere with a white line distinguishing the day cream from the night one, which has a black band circling the midpoint. They look luxurious together with the clear jar with “pearls” of the same line. After 5 weeks with two of us using it once a day, we still have half a jar left. This rich, silky cream is based on Oil of Argan, specifically Argan Stem Cells in combination with Hyaluronic Acid, two powerful active ingredients for a targeted action against signs of ageing. After a test period of over five weeks, I am extremely pleased. I have been using this at night, alternating with the Resculpting Cream with Pearls of the same brand. 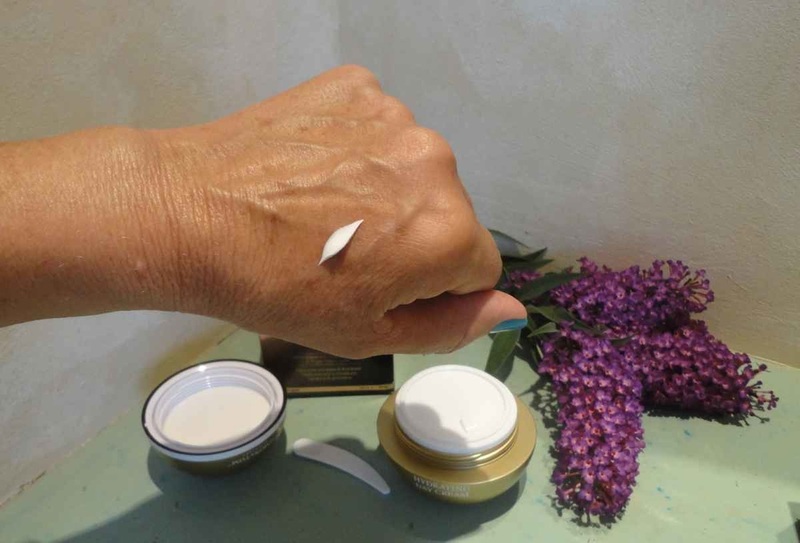 Using the two in combination, I have noticed a certain tightening of fine lines and a smoothing and filling of the deeper wrinkles; a subtle change but still very welcome. I am also delighted with its richness. Often I have to use two hydrating and nourishing products in layers, whereas this cream does the job by itself. I find the perfume delicious, to me it smells of white flowers like jasmine or lily-of-the-valley. And finally I love the jar, a golden globe with a black line to distinguish it from the day cream which sports a white band. Judging from my usage so far, I estimate that it will last me at least two months. Like the rest of this line, an effective, luxurious product which remains quite affordable. This fabulous anti-ageing treatment is a pure joy to use. 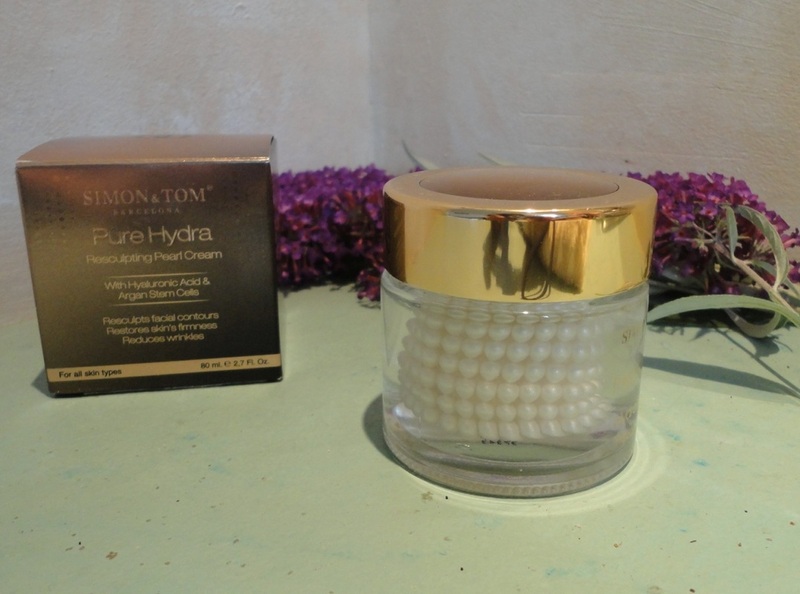 I had never seen anything so beautiful in a jar of face cream; the active ingredients (Argan Stem Cells, Chamomile extract) are trapped inside spheres that look just like pearls, suspended in a clear gel of Hyaluronic Acid that is designed to be mixed just before use. A tiny spatula is included so you can extract what you need without disturbing the rest. It's hard to describe the effect, but this is absolutely the most visibly hydrating product I've ever tried. After application and a light massage, my face and neck look like I've just come out of the shower, with dewy droplets covering my skin and a fantastic fresh sensation. It all gets absorbed rather quickly, and it is now my night-time treatment of choice. At 63, my skin tends to dry out fast after cleansing, and inevitable lines and wrinkles have appeared. I can't expect them to disappear, but I think this cream is undoing some recent damage and certainly it helps my skin stay fresh even after swimming and sunbathing. I love everything about this product, pure luxury (I can't believe the price). Comparable to the most expensive top-name brands, even the scent is like an expensive perfume; I don't normally care for strongly-scented skin care but this is my exception, it smells delicious! The texture is like the softest cream melting into a watery gel. The clear glass jar holds 80 ml which is lasting well over a month with two of us using it with abandon. I haven't had any allergic reaction, so I would say it's suitable for sensitive, even fragile skin. I'm using this in conjunction with the other Pure Hydra creams and I would say that this is the gentlest hyaluronic acid product I've ever tried. My skin is looking better and better (at least according to my husband) and I hope the firming action will continue because it's taking years off my face.